and dig for worms for a fishing trip. and begged us to toss one out. to dig for a can of worms. was our ultimate dream of fun. where the streams of traffic flow. and it wasn’t the fun I thought. from Time’s grim firing line. when Mother cooked with wood. each morning to the hood. the passing of the wood. and Mother cooked with wood. said I’d not chopped enough. a source of care and pain. As I have written in other posts, I was raised by my aunt and uncle, apart from my family. We lived in the city of Saskatoon, SK; they lived in a little house in the tiny town of Pathlow. 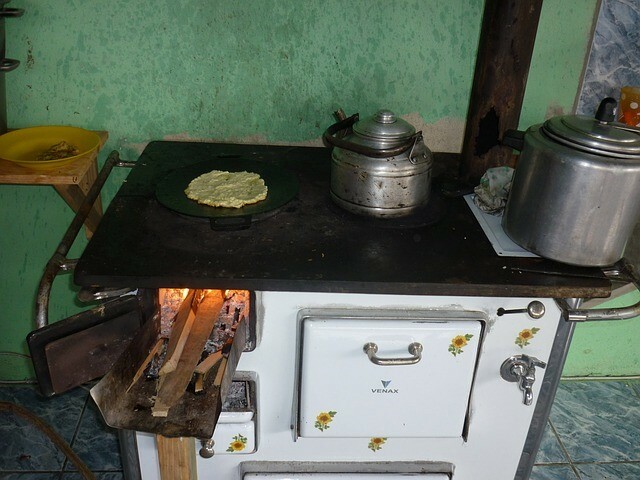 And I suppose we had natural gas heat like most folks would have, but when I’d go back to Pathlow and spend a week or so with my birth parents and siblings, I got to experience the joys of the old wood stove. My Dad had piled firewood not far from the house, quite a huge stack, as I recall. About as high as I was and maybe fifteen feet in length, full of logs sawn to about two-foot long. Most of these were too round to cram into the stove whole, so my Dad or my brother had to split wood for the stove every few days. I can remember watching them setting logs up on end and swinging the axe to split the logs. The axe would come down into the log and usually get stuck; rarely could the chopper slice a log clean through at one blow. So he’d lift axe and block together and bring it down again on the chopping block, splitting the log the rest of the way through — or at least a little farther. Repeat as necessary to get the axe all the way through. The wood up in northern Saskatchewan was mostly poplar a very soft wood. No hard woods like the maple or oak Mr Guest would have been splitting in the Eastern US. He would have had his work cut out for him splitting those logs. Most of the logs could be halved, but some were chopped into thin strips of kindling that would catch fire fast. The fire in the wood stove went out every night and had to be relit every morning — with very chilly fingers if it was winter. You needed paper and thin strips of kindling to light the fire and were very thankful when it started right away. In winter the bedrooms were icy so children often came down to the kitchen wrapped in their blankets, with clothes in one hand, to dress in front of the wood stove where it was warm. We have a small wood-burning stove set up in our living room to keep us warm in case our electricity ever fails in cold weather. When the temperature drops to -20 C outside and the power goes off for several hours, you get a mite chilly! So my husband gets the wood stove going to keep the living area and kitchen warm. As the poet writes, there’s something quite pleasant about having a wood fire going. What brought this to mind? I opened the door this morning to let the cats go outside for a bit and I smelled wood smoke. Somebody has a wood fire going and the smoke is drifting over this way. I hope! I hope it’s not another forest fire burning in the north. My 100-word story, The Wrong Suitcase, was posted on The Drabble e-zine yesterday. You can read it here. Every now and then you read a book and afterward you want to tell all your friends, “You should read this! It’s inspiring, enlightening, and generally terrific.” Reading this book has challenged and strengthened my own faith. Bruce & Shara Repka have traveled all over the western USA singing and ministering. They endeavor to follow the Lord’s leading and are keenly aware of his appointments. They enjoy the blessing of seeing his hand at work in people’s lives, learning lessons of faith, trust, patience. They’ve worked as trail hands rounding up cattle, ridden their horses over the canyons and badlands. They’ve spent time seeing and learning to love the rough-and-tumble crowds as God sees and loves them. In Walk Like A Warrior they share a number of experiences, insights, and lessons learned. I really appreciated all the appropriate scripture verses accompanying each section. I’ll admit I can’t totally identify with every experience these folks have had — but I don’t feel I need to judge anything here. If God chooses to bless them with miracles I haven’t observed personally, that’s up to him. As Shara brings out so well, the Lord leads his children in individual paths where we can fill our role as a light for Him. The couple share a number of answers to prayer that demonstrate God’s ability to meet our needs. Bruce and Shara Repka (a.k.a. Pony Express Ministry) are a Christian country music ministry that travels the highways and backroads of the western United States with their two horses, Rocky and Nocona. Traversing the countryside in their fourteen-foot, short-wall, three-stall, living quarters horse trailer, they travel and minister wherever God sends them. Their, and others’, inspirational true stories are a testament to how God reveals Himself and encourages us in our everyday lives. They have seen firsthand a real, loving, and powerful God who is always true to His word and who longs to have a personal relationship with us all. I was given a free copy so I could write an honest online review. Another Friday Fictioneers prompt has come. This group is graciously hosted by the longsuffering Rochelle Wisoff-Fields, who blogs at Addicted to Purple. Check her blog for information about how to become part of this group and respond to the prompts. Our photo prompt has been donated by Kelvin Knight. Bear in mind that this is his photo and must not be used for any other purpose without his permission. I looked at the prompt this morning and thought, “This is great!” No murder and mayhem in this photo; it should generate some really homey, upbeat stories. So what delicious aspect can I write about in connection with home-made bread? Sad to say, the story that popped into my mind a moment later is one I didn’t want to write. I hate going to places like this but I feel this is the one I should tell. Genre for this one is contemporary fiction, based on a true account of a young woman’s loathing for white bread and how she discovered the reason behind her disgust. I’ve had a few similar experiences where I felt an intense fear or negative reaction to something for years until I finally asked God, “Why?” And got a clear answer. I believe many children experience things that leave them with a closet full of dark memories. It’s so awesome, then, when you finally open that door, the skeleton inside gives one last rattle and disintegrates. The place is swept clean, the dust swirls away and you’re so glad to be rid of the mess that you feel like dancing. Memories click into focus. Mom never home. No food. Older brother, bread in hand, luring her…she was so hungry! Ugly stains on the bedroom ceiling…waves of shame and disgust. The bread her reward. Waves of freedom overwhelm her. Her spirit dances like a sailboat in light breeze.